PINEHURST, N.C. (July 13, 2018) – It’s long been said that Pinehurst No. 2 will reward the best of shots, but should a player make even the most minor of mistakes, the results could be devastating. The Northwestern senior appeared to hit a beautiful high-arching iron into the par-3 15th, only to watch from the tee as the ball trickled off the back of the green. From there came perhaps the most cursed shot at Pinehurst, as her putt back up the bank ran to the crest of the green – but no further – seeming to come to a stop until it agonizingly rolled back to Lau’s feet. Lau lost more than just the hole to Australian sensation Gabi Ruffels late in the championship match of the Women’s North & South Amateur. She lost her only lead to that point in the match, which began with her falling 3 down through the first three holes. But as Lau walked slowly to the 16th tee square in the match, she perked up a little. She blasted her drive a staggering 275 yards – some 45 yards farther than Ruffels – leaving herself 193 yards to the front of the green and 215 to the pin of the par-5. “I looked at my caddie and said, ‘That’s a perfect 5 wood,’” Lau said. After Ruffels laid up to about 100 yards in front of the green, Lau blasted a soaring shot high and deep into the Carolina blue sky, the ball fading ever so slightly. When it landed on the green, there wasn’t so much applause as there were gasps. Lau had 5 feet for eagle. “That shot on 16 was amazing,” Ruffels said. Lau made the eagle to win the hole and regain a 1-up lead. And when she stoically made a testy 5-footer down the hill for par on 17, she had completed one of the more remarkable comebacks to beat Ruffels, 2 and 1, and win the 116th Women’s North & South Amateur on No. 2 on Friday. The championship match had a lot to live up to following Thursday’s dramatic semifinals. Ruffels needed 22 holes and a slew of clutch putts to finally knock off Natalie Srinivasan. Lau was 1 down headed to 17 against Ruffels’ countrywoman Becky Kay, but made birdie from off the green at 17 and then made another long birdie putt on 18 to extend the match, which she won in 19 holes. The final, though, managed to add to the drama of the week. Ruffels took a 3-up lead through just three holes as Lau missed the first three greens in regulation, even putting off the third green. But Lau’s length off the tee – and another beautiful 5-wood approach – helped her win the fourth hole, and after a birdie on the par-5 fifth, she had trimmed the deficit to 1 down. She then made a nifty up and down from the front of the sixth green to square the match, winning three straight holes to pull even after the difficult start. Ruffels and Lau traded wins on 7 and 8, and the first time they halved a hole was when both made bogey on the par-3 ninth. Still, the match went to the back nine all square. It went back and forth because that’s when both players found their games. They both birdied the par-5 10th, and after leaving her short-yardage approach to 11 in front of the green, Lau chipped in for birdie. Ruffels, though, halved the hole by making a 12-foot putt, keeping the match square to the delight of the sizable gallery following the match. Lau missed the 12th fairway by just a few feet, her ball coming to rest near a wire grass bush on top of a small mound. But she hit a lovely approach shot into the green about 20 feet from the pin. Moments later, Ruffels hit her approach almost to the identical spot – the balls came to rest on the green almost touching each other. “I’ve never seen two balls that close before,” Lau said to Ruffels while walking to the green. Congratulations to Stephanie Lau, the Champion of the 116th Women's North & South Amateur. Both players then burned the edges of the cup on their birdie tries, Ruffels on the right edge of the hole, and Lau on the left. Both players hit nice approaches into the short par-4 13th, with Lau’s ball trickling just off the back fringe. Facing a slick downhill putt, Lau made the birdie try from about 12 feet, making her third birdie in four holes, and taking just her first lead of the match. They halved 14 before Lau’s mistake at the 15th allowed Ruffels to square the match one last time. Lau took care of the rest. The Women's North & South has drawn the top amateur women from around the country. Three rounds of stroke play followed by four rounds of match play will determine the Champion. The 96 player field will be cut to a 16 player match play field and medalist honors. All stroke & match play rounds will be contested on Pinehurst No. 2. The top 16 players who qualify for match play will play two rounds a day until our champion is determined. Nine of the last 12 North & South Women’s Amateur champions have drawn paychecks as members of the LPGA Tour. The equation is near perfect. 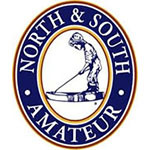 Win the North & South Am, go on to professional success at the highest level. North & South champions are among the legends of the game: Babe Zaharias, Louise Suggs, Peggy Kirk Bell, Hollis Stacey, Brandie Burton, Brittany Lang, Morgan Pressel and Yani Tseng. Along with the Women's North & South, Pinehurst Resort & Country Club annually plays host to the Men's North & South, the Junior North & South, and Senior Men's and Senior Women's North & South.